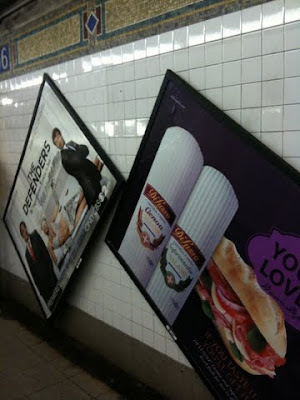 Public Ad Campaign: Unauthorized Public Work or Coincidence? Unauthorized Public Work or Coincidence? My good friend Adriel just sent me this photo from the 96th street 4-5-6 station. He says it looks like someone removed the ads intentionally and then arranged them like this. They look too precarious to be the work of a CBS employee. In fact removing these ads only requires a regular philips head screwdriver once you've dug out some putty placed over the screws in each of the 4 corners, so it is entirely possible. If anyone did this, or knows who might have done this, please write us as we are very curious if there is a new sculptural form of ad removal that is about to bloom in our city.